Today's theme is "Defending Without Fouling"
There has been a lot of talk on this year's NCAA March Madness telecasts about teams that play good defense without fouling. Bo Ryan's Wisconsin Badgers are the prototype, averaging only 12 fouls per game! Others include Norte Dame, Virginia, Wyoming, San Diego State, Cincinnati, and Northern Iowa. Give your opponents fewer free-throw attempts. 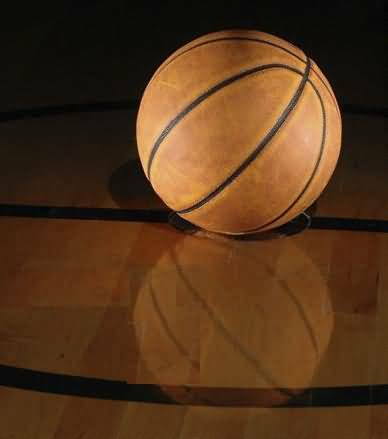 Giving your opponents free-throws, gives them easy, uncontested points, without taking any time off the clock. Of course this assumes they can actually make their free-throws, which seems to be becoming a lost art these days. Fouling often "bails-out" the offensive player. How often do you see a team playing great defense with shot clock under 5 seconds, and then someone fouls a penetrating guard - bails him out? Chances are he/she would not have made the shot. It's really amazing how often even good college players miss lay-ups and put-backs right under the basket. Don't help them by fouling. Not fouling keeps your best players on the floor. Obvious... you can play the 4th quarter or overtime with your best players. Not fouling allows you to play aggressive defense at the end of the game. If you have "fouls to give" (not in the 1-and-1), you can defend aggressively in the last few minutes. If you do foul, the ball has to be inbounded, no free-throws. So you force them to inbound the ball, with a possible chance for a steal or a 5-second call. If they do get the ball in, they have to reset their offense which often eats up a few valuable seconds. So how are we going to turn our bunch of "hackers" into a team that doesn't foul??? You have to make it a priority of teaching your players to play smart and play defense with their feet, not their hands. Coach Bo Ryan was asked recently how to avoid fouling: "Don't leave your feet, don't reach in with your hands." Perimeter players. Perimeter defenders must learn how to keep the ball in front of them, contain the dribbler. Footwork and lateral quickness drills are the key to this. They must be disciplined and not reach-in, grab, or become overly aggressive with hand-checking. Keep the feet on the floor when the shot (or shot-fake) occurs... don't foul the outside shooter. Close-out with feet on the floor... don't "fly" at the shooter, trying to block the shot. Post players. First, deny the pass into the post. Once it gets there, the post defender should make contact with his chest, not his hands, forearms or legs. Elbows are up and arms are out where the ref can see them. Coach Ryan insists that his post defenders keep their feet on the floor and NOT go for the shot-block. Keeping your feet on the floor means you won't fall for the shot-fake... which often results in a foul when the defender is caught in the air. And when you are in the air, you are not a rebounder. Keeping your feet on the floor allows you to box-out and rebound the missed shot. Practice drills. It has to become a priority in practices from day #1... learning to play smart without fouling. Have your assistants officiate drills and 5-on-5 scrimmaging, with the penalty for fouling as strong as the penalty for not winning the drill. In defensive drills, put tennis balls in both hands of the defenders. That way, they can't use their hands, but can still move their arms for balance and deflecting passes. So does not fouling translate to less defensive intensity? Absolutely not! Defenders have to be more intense when moving their feet and playing good defense. Playing defense with your hands, reaching-in, is usually a result of lazy defense. Style of play. 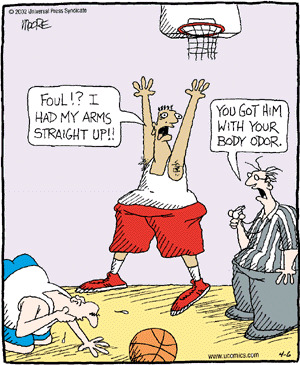 If you full-court press, you risk getting more fouls. This is not to say that you shouldn't press, if you have good, quick athletes. 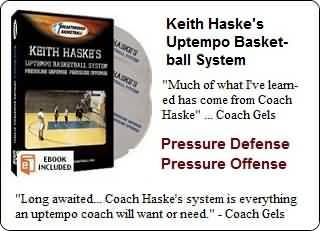 But you must learn how to press without fouling. Fouling in the back-court is not smart basketball. Not infrequently I'll see high school players get a good trap on the ball, only to negate it by reaching in and fouling. Players must learn to pressure the ball without hand-checking, bumping and "riding" the offensive player. In the half-court, you will have less fouling if you can keep the ball in front of you and sag into the gaps (help and recover), to prevent dribble-penetration. You do not need to extend the on-ball defense way outside beyond shooting range... just keep it in front of you. If you can make the opponent settle for outside shots, it's usually a good thing. A "packline" style of defense is often effective. Scouting. Good scouting might reveal certain tendencies about your next opponent. They might try to draw fouls by faking the 3-point shot, or by dribble-penetration, or by shot-faking on the low blocks. You can preemptively discuss what to expect and how to avoid fouling in these situations. Scouting can also help you with your 1-on-1 match-ups. Officiating. I know an official would never admit it, but there is a psychological pressure to "keep things even" in regard to team fouls. When your opponent has 10 fouls and you only have 3, and fans are screaming at the refs about the number of fouls, there is pressure on the officials to call some fouls on your team. This will not affect a good official however. In a Wisconsin game, an opposing coach screamed at the ref, "When are you going to call a foul on them?!" Bo Ryan yelled back something like, "When we actually commit one!" Smart play begets smart play. Teams that play smart and disciplined on defense are often smart and disciplined on offense. They often take care of the ball with fewer turnovers. They tend to make better decisions, good passes and take good shots. These are all part of a recipe for success.